This week a film crew invaded El Cotillo to film some scenes in the sea off the cliffs between the new harbour and the Toston tower. They are making a Spanish film called Solo which tells the true story of a Spanish surfer, Álvaro Vizcaíno, who fell from the cliffs near Cofete. He received serious injuries and spent 48 hours on the rocks awaiting rescue. No help came so he took to a surf board to get help. It stars Alain Hernández and Aura Garrido. The director is Hugo Stuven and the Director of Photography is Ángel Iguácel. The film crew will be on the island for a total of 5 weeks. They are filming at various locations, including Tindaya and Cofete. 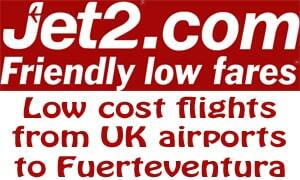 I wonder if El Cotillo actually benefits from them being there? Certainly the local bars and restaurants didn’t benefit as they had their own catering truck. 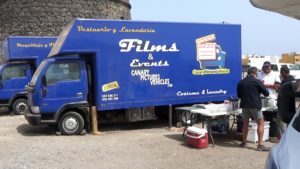 Fuerteventura as a whole charges for licences to film; the best hotels benefit from lots of rooms let; car and van hire companies benefit; and perhaps a few locals are employed as drivers/extras. I have to say that the film crew were much nicer than the last time a film crew invaded El Cotillo. They were the arrogant Hollywood lot who filmed Exodus. If it had been used for Star Wars then El Cotillo would have been “shut down” but this crew had no special privileges it seems. The public had access to everywhere as normal. I would estimate that they had 10 trucks, 5 motorhomes, 5 minibuses, 6 cars and about 60 crew. All of that to film a few minutes footage of someone lying on a surf board in the sea. Hopefully I will get to see it so will look out for Solo (2017 film) on tv.